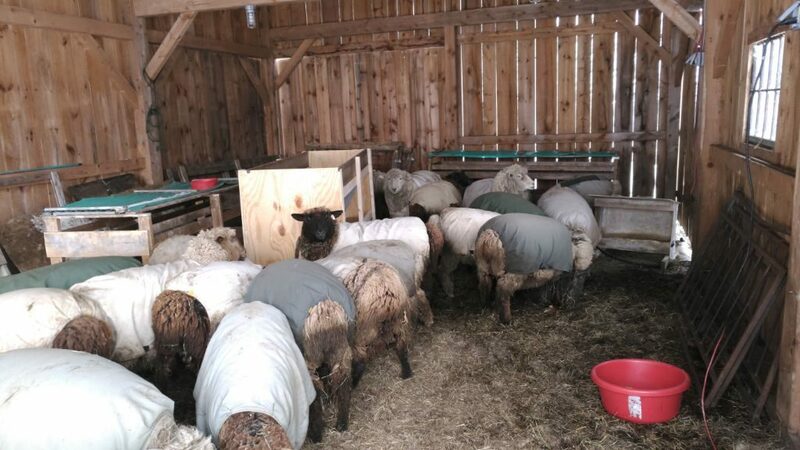 Shearing is a week from today – Saturday, March 23rd. It’s Peg’s favorite day of the year, and a great group of helpers will be here to help us skirt, weigh, and bag the fleeces. I THINK we have 33 animals in the barnyard (I emphasize that because all winter I have been telling people, “32”). Some things have to happen to get us ready. First, moving a 10 foot panel that separates the boys’ section of the barnyard from the girls’ section. We need to do this so we can get the boys into the barn with the girls where Gwen Hinman will shear, trim hooves, and inject the ewes with CDT. After lunch, I headed up to the barnyard with a shovel. 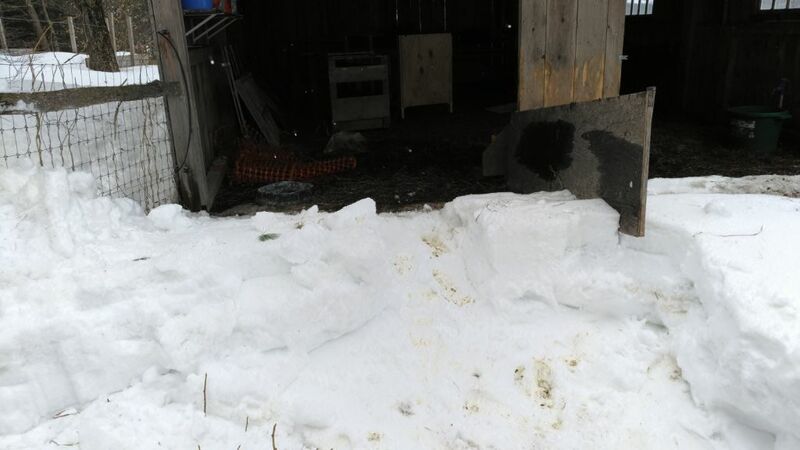 I needed to move about 18 inches of snow cover so I could rotate the panel to make the opening to the barn. Fortunately, the snow is soft and not packed down – I was able to shovel pretty much all the way to the ground. 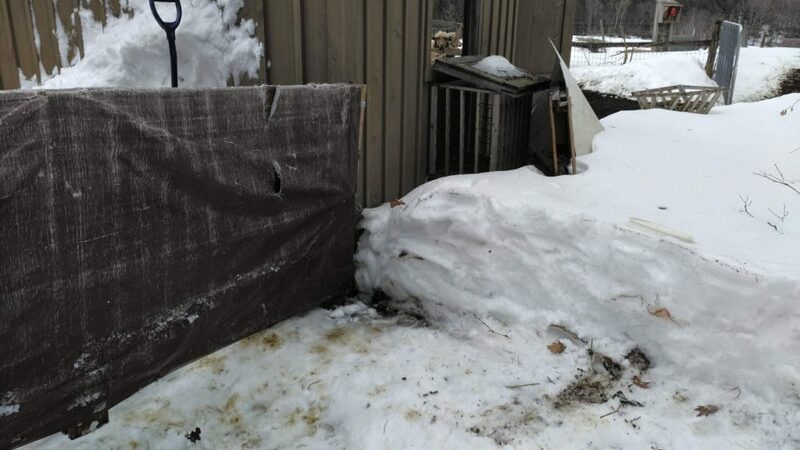 After clearing about 80 square feet of snow (120 cubic feet), I went to move the panel. 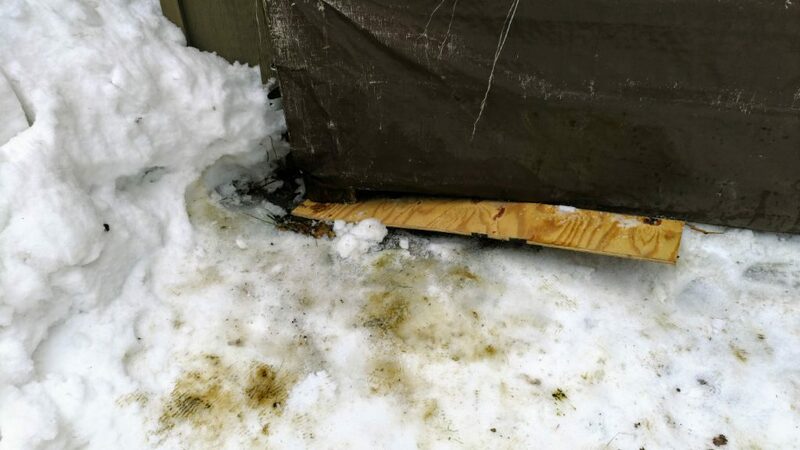 The left end of the panel, up against the hay shed, was frozen to the ground. Back to the garage and fill a 5 gallon paint bucket with about 3 gallons of hot water. Back up in the barnyard, pour it on the left end of the panel. Nothing. Rather than marching back to the garage, I just fill the paint bucket from the spigot in the barn. After about four bucket-loads, the side comes free and I’m able to rotate the panel 90 degrees to make the opening. 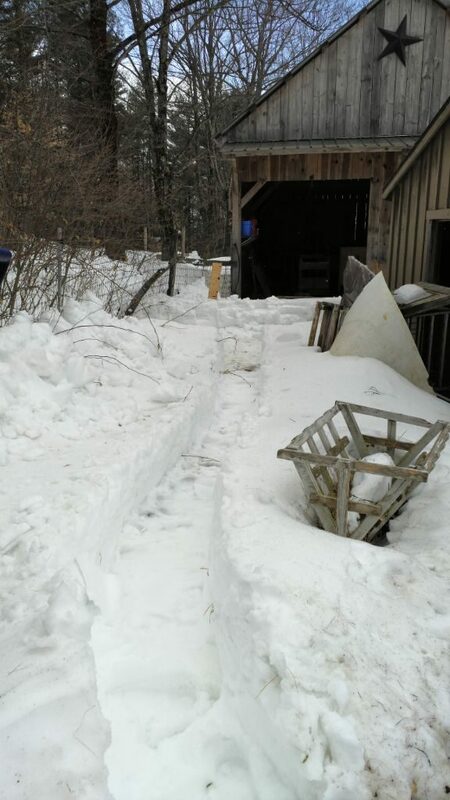 A little more shoveling to make a path from the boys yard to the opening and from the opening to the barn, and I’m done. I wedge a piece of plywood under the left end of panel so it won’t refreeze. Mission accomplished in about 45 minutes. Since we’re less than a month away from the likely start of lambing season, I fill a paint bucket about halfway with grain and feed the girls. The lamb fetuses are going to be growing rapidly over the next few weeks, and the additional protein will help the moms-to-be. A couple ewes aren’t all that excited about the grain – maybe they aren’t pregnant. 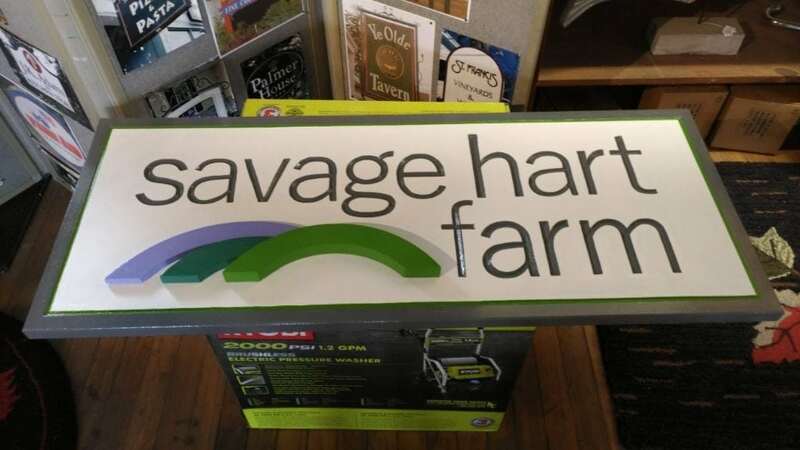 Yesterday, I drove over to Flying Cow Signs in Manchester, VT to pick up a new carved/raised logo wooden sign that Peg gave me for Christmas. It measures 40″ by 16″ and looks great. 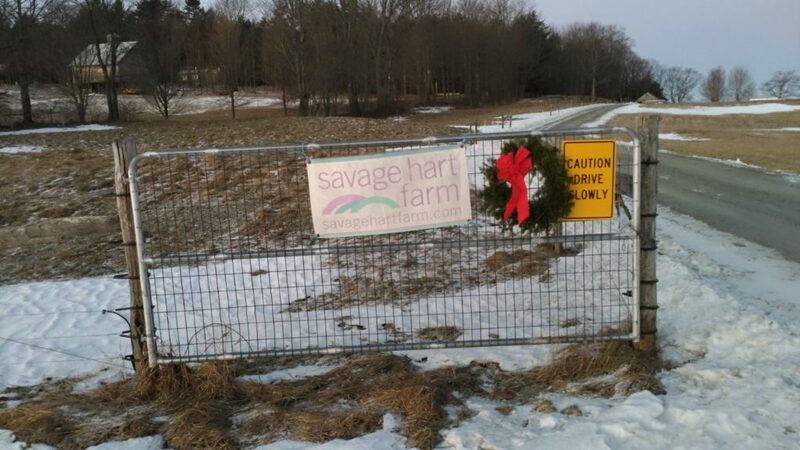 Once the snow melts, Peg and I will replace the nylon banner that is on the gate at the bottom of the driveway. 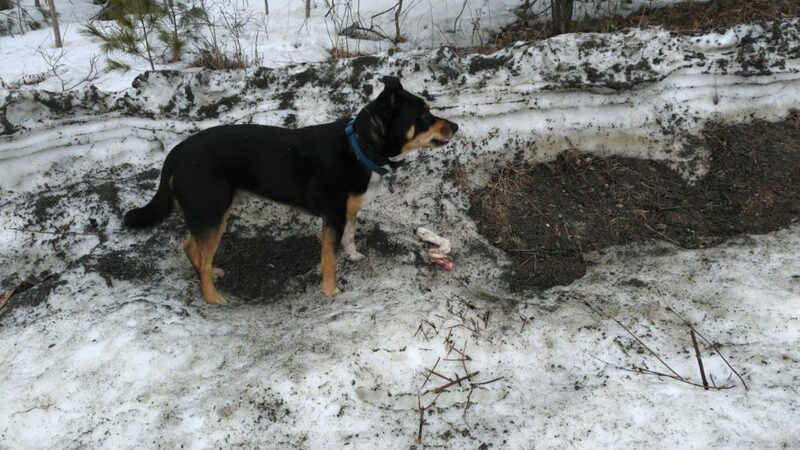 Finally, on today’s morning walk, Jack found a severed lamb leg on Wallace Road. I tossed it over the snowbank. On our way back, Jack picked it up and carried it back to the farm – at least a mile – and played with it outside. Peg wondered if it might be from the Teachouts flock, which is on the other side of the valley.